A lot of us talk about our horses all the time, and many times, our dogs come up. I have mentioned mine here and there, but I figured it was about time to devote a whole post to her. Hold on to your hats people, because there are A LOT of pictures. Hannah (AKA Hannah Montana) is an 8 year old, Blue Heeler mix that the husband rescued from the shelter as a puppy. Do not let that face fool you. Apparently, this girl was… not a good puppy. How bad was she? Well, apparently she refused to be house trained… or crate trained. She thought the best use of a crate was to contain all of your poop and pee, so you can roll in it. Fun stuff. How did Matt house train her? He threw her out with the goats for a while. Somehow this worked, and Hannah has turned into a really wonderful dog. When she met my grandmother, she was so excited that she ran up to my grandma… She must have immediately realized that her usual exhuberant greeting wouldn’t be appropriate, and she sat down in front of my grandma. Her whole body was shaking with excitement, but she didn’t dare jump up or bump into her. She just waited patiently for her pets. She has met May a few times, and used to come to my barn in NJ regularly. My trainer at the time brought her two dogs almost everyday, but they were older, female, and (mostly) calmer. They got along great with Hannah, and Matt was able to come with me when we brought her. While May is great with dogs and Hannah is mostly good with horses, she doesn’t really appreciate me riding. She is very concerned for my safety and will whine as I ride past, especially at the canter. The first barn I was at in KY didn’t allow outside dogs, although she came by once when I had to make an early morning run to treat May’s eye before we drove to Kansas. She has not been to the new barn. Although the new barn is dog friendly, Hannah is… a wimp. How much of a wimp? She has been attacked at least twice since I have known her. Why? Because if a dog comes bounding towards her, wanting to play, she will cower and roll over and tell the world that she is a wimp. Soooo she gets attacked. Let’s face it, she was the star of our engagement pics. While the dogs at the new barn are very sweet, I think it just would be too much for Hannah. Last night, there were 6 or 7 dogs at the barn. They ranged from a big chow mix from next door to a small pug and from basically puppies to much older dogs. Just too overwhelming for poor Hannah, who really likes being an only dog with her own yard. What about you? Do you have a dog (or other non-horse pet), and do they make it to the barn? How Do We Grow Horse Sports? So this post was inspired by a post that was submitted as part of the HN Blogger Contest by Carson Nelson. In the post, she hypothesized about why people don’t get into horse sports. The number one answer she found – money. However, I am not sure I buy that. I have looked into how much it costs to join a yoga or pilates studio… I have seen the cost of barre classes and crossfit memberships. The truth? They aren’t a lot cheaper than riding lessons. Throw in a cheap pair of paddock boots, a barn that has helmets, and yoga pants (or even jeans you already own! ), and you are about there in terms of clothing. Again, not much more than a yoga mat and appropriate clothing. Please be aware, all of the below is a HUGE generalization of the horse market, and it is not directed at any person, barn, or organization. It is just my observations as a member of horse sports in, arguably, two of the most horse-dense areas of the country (excluding NYC). Chart from The State of the Animals IV: 2007. Highlights mine. I think it is terribly confusing, difficult, and discouraging to try and find a lesson barn as an adult, ESPECIALLY as a beginner. We no longer live in a culture of phone calls to strangers. We live in a culture of email, contact forms, and online scheduling. Farm websites tend to be clunky, not mobile friendly, and lack even basic SEO to show up on google searches. As someone who moved to an area and knew no one, I know how much power your website can have. For a beginner adult – they are looking for something that looks approachable. Unfortunately, most websites either show an amazing plethora of small children, with no adults, or they show shiny show horses and only people in full formal attire. Neither of these things is likely to resonate with someone considering taking riding lessons. Is this relatable to the average person? Maybe? Farms can also have a nasty habit of hiding costs, leaving outdated prices on their website, or telling people to “Call for Pricing.” Pricing is readily available for nearly any product we could want, and we can pay for almost anything with a credit card. Therefore, it can be a bit off-putting to not find the real price of a service on a farm’s website. How many times have you heard of someone being burned by a barn, including experienced people, because they weren’t made aware of other charges they were incurring? It goes from something as innocent as “would you like us to tack up your horse before your lesson?” (no mention of it being $15 extra) to THOUSANDS of dollars worth of charges at someone’s first competition. Nothing quite like having to shovel over some of your savings to make you want to quit a sport. Trainers – have a rate sheet. Hand it out. Post it online and in your barn. If you don’t know how to do this, I can guarantee you that someone in your barn does. Let’s face it. Horse sports fall pretty far to the bottom of the diversity spectrum. We lack diversity in race, ethnicity, body types, and socio-economic status, among other areas. At the lower levels, the only Olympic sport where men and women compete against one another also lacks gender diversity. There are a multitude of reasons for this, but let’s just say that being friendly, welcoming, and promoting a sense of inclusion at barns would probably help keep everyone more involved. It is scary enough to join a new sport as an adult. As for me – how many classes have I taken in sports/classes I am not already familiar with, alone? (None). If you are an average sized woman or man, are you going to call the barn that only shows very slim riders in white pants in their photos? Or no one that looks REMOTELY like you? Didn’t think so. Where are the Mimosa Rides? or the Wine Wednesday Evening Lessons? I will admit, both of these things appeal to women more than men AND serving alcohol with horses is a terrible business idea. However, there is just about no marketing barns do to encourage adults to come try riding lessons. In contrast, I have seen “Back to School Specials”, “Spring Break Sessions”, and “Summer Camps” for the under 18 crowd. Let’s try material that is targeted for the adults. Hey, it could even be “Back to School Specials” with special lessons during the day for stay-at-home adults. Most adults don’t want to lesson with children. We learn differently, our bodies react slower, and our muscles don’t grow as fast. Trainers need to offer private and semi private lessons to accommodate adult schedules. AND have the horses to accommodate them. Hilarious photo of May as a “lion” and me as a “lion tamer”… This is a fun facebook pic… but probably doesn’t below on your barn website. I am sure I can go on, but I think this is a good start. Is there a market for this? Honestly, I think there is. Plenty of adults lacked the funds, time or access to horses as kids that might be able to try it out now. MANY adults are bored, and open to trying something new. I don’t think large membership campaigns, such as USEF’s “Join the Joy”, have made any significant strides, especially outside of the already established horse community. Growth will have to be the grassroots kind, and, as tough as it is, that starts with the trainers and riders with their boots already planted firmly on the ground of their communities. What do you think? What can riders, trainers, and organizations be doing to help grow new interest in horse sports? Or maybe you just know me personally and know that I moved May to a new barn! The “reasons” are pretty mild, as far as these things go. I wanted to be with a trainer that had more of a “team” going to the local shows like the one I did last month, I was also looking for someone who was around for at least most of the winter months, and I was looking for a program where a bit more of the horse care was on the trainer instead of the owner. This is 100% a preference thing, but I think this type of program just works better for my lifestyle. The barn is part of a 40 acre farm, but NT only manages the small barn in blue. May will be turned out in the field that is circled in green. The other part of the property is rented by a Dressage trainer who has her Silver medal and is an L graduate. Both sides get along well, share both arenas, and share some general barn duties (like dragging the arenas). I liked this mostly because it means that, even if NT is away, there is another professional keeping an eye on the arenas/general barns. New Trainer (NT) goes to Aiken for a couple of weeks before the start of the season in KY and travels a bit for shows, but that works for me. The barns are completely separate, so that keeps both programs from bumping up against one another. The covered building next to the small barn is the indoor. This isn’t my picture, so sorry it is in a weird format. The interesting thing, for me, is that this is the first “open” indoor arena I have ever ridden in. They don’t close it in the winter, so it might be a bit cold. However, I figure it shouldn’t be much colder than a stand-alone, closed in indoor. In fact, it might even be warmer, as sometimes that stand alone indoor is like a fridge! The indoor and outdoor arena are right next to each other (see the pic below). Next to the outdoor arena is a big open field, which most people use to either warm up, cool out, or do some fitness. The property next to ours is also open to us to go trail riding. I am pretty excited about getting to explore those a bit more! 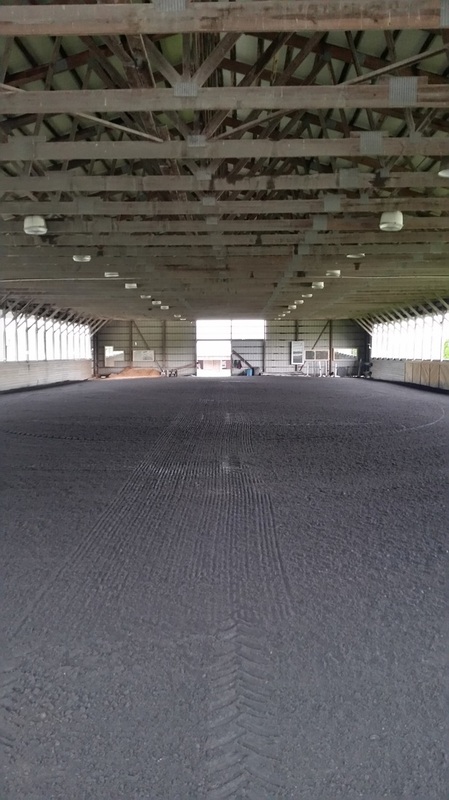 The barn May is in has an interesting setup, with a main barn aisle with stalls, tack room, feed room, etc and then a line of stalls that just open to the outside of the barn and back up to the feed room, tack room, etc. May is in one of those outside stalls, and she seems to LOVE being able to stick her head out and watch what is going on out in the fields. While the barn gets a nice crosswind with all the doors open, here are also ceiling fans that keep the air moving. Since the horses are in during the day, May seems to be really appreciating this feature. So far, everyone I have met at the new barn has been super warm and welcoming. It’s definitely a very social barn, which I realized I had been missing more than I realized. I think that is pretty much it! May settled in really well. Although, she was a bit of a beast for our first ride on Tuesday. I think this was more due to the fact that I had barely ridden her the week before vs. the stress of moving. Either way, I have my first lesson tonight, so stay tuned!